HABIT: Tiny white bell shaped flowers from spring to early summer. Attractive upright foliage. Will thrive in full sun, but will also grow well with some light shade. CULTURE: Easy to establish and maintain. Divide in the fall if planting becomes crowded. USES: Borders, spring and early summer color. PROBLEMS: Few of a serious nature. NOTES: Native to North Africa and the Mediterranean region, this bulb is one of the easiest to grow and naturalize ieasily in the South. 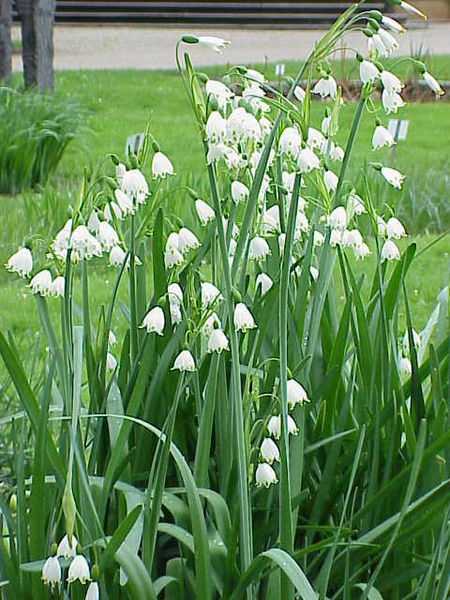 Bulbs produce clumps of dark green, strap-like foliage followed by inflorescences that each develop several white bell-shaped blooms which are mildly fragrant and have small green dots at the ends of the petals. Similar in growth and culture to lily of the valley. Similar to daffodils, they can be grown under deciduous trees and shrubs to create a natural woodland look. Plant bulbs about 5 to 6 inches deep and about 2 to 3 inches apart for a nice display. Plants will grow to a height of about 18 inches at maturity. Clumps will multiply and spread from year to year. They like a moist, well-drained soil, but seem to thrive in heavy clay soil. Provide regular watering during spring when plants are actively growing.